If there were a gas leak in this home, it would be impossible to turn it off, since the valve is buried under the concrete blocks. 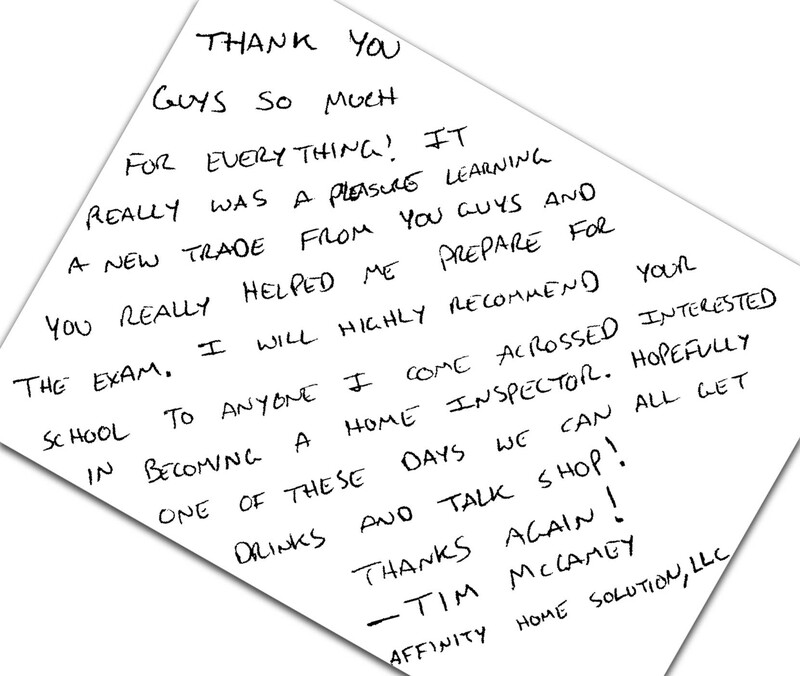 As a home inspection educator, I think is very important to consider earthquakes when evaluating a home. In our area, regular earthquakes are a part of life. Everyone should prepare for what will certainly happen again. 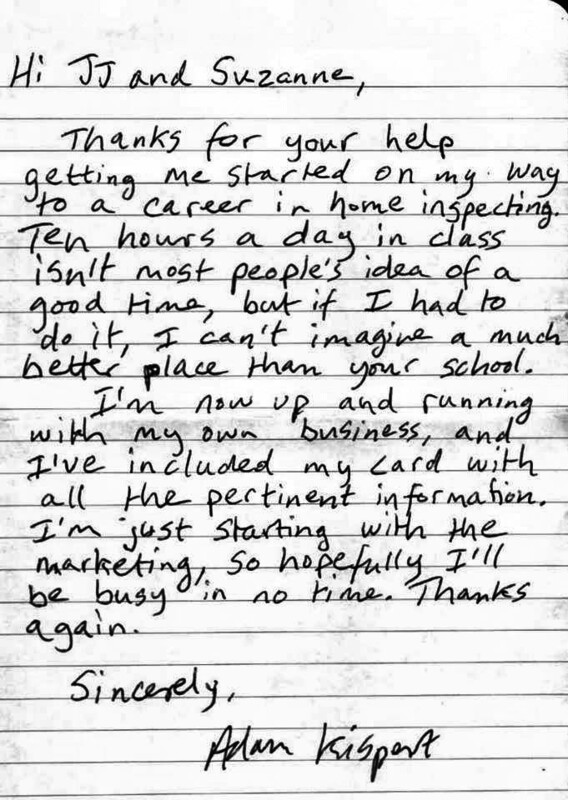 Everyone needs to know where and how to turn off all utilities to your home. We often see these shutoff locations inaccessible – never block a gas meter shutoff valve, water shutoff or breaker panel! In an emergency, you must be able to shut these off or risk fire, explosion, electrocution, serious water damage, or your life. The main shutoff for most homes is sometimes hard to find. Since these valves are rarely used, they will often leak when you turn them off. 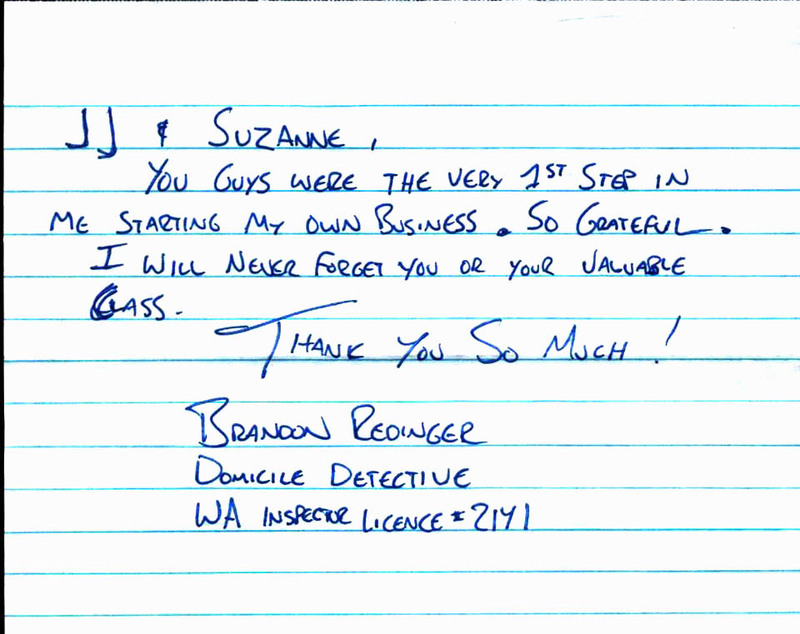 For these reasons, we recommend that you locate your main shutoff at your water meter. This valve is usually under a cover near the sidewalk or at the edge of the road. Open this cover and look for the valve. You will need a tool to turn this off. There are a couple of types of valves, so it is important to look at yours and make sure you have the proper tool to turn off the water. Most of them can be turned with an adjustable wrench, similar to the valve on a gas line. Others may require a special tool available at your local hardware store. If you are on a well, familiarize yourself with the equipment in your pump house so you know how to turn off the pump and water valves. These shutoffs are located at the meter. It is best to tether a wrench to the meter, so you know it is there when you need it. Your propane tanks have shut off valves at the lines connecting them to the home or appliance. If you ever smell a strong odor of gas (rotten egg smell) shut off the gas immediately, turn off the electricity (this can prevent explosions or fire) and open all the doors and windows. Call 911 for the fire department and the gas company to locate and isolate the gas leak. Video demo to turn off your gas. Video demo to turn off propane. You should know how to turn off the power to your home – usually there is a main shutoff in the breaker panel or at the power meter. Occasionally, there is no single main shutoff, in this case, turn off every breaker in the panel. If your home has a fuse box there will sometimes be a shut off above or beside the box. If there is no shut off, then unscrew each fuse and lay them out in the same pattern as they were in the box. This is so you can replace each fuse in the proper location and not mix up the amperages of the circuits. Most older homes also have two or more pull out fuse holders, so remove these also. Video demo to turn off electricity. When there are earthquakes, water heaters will often fall over. All water heaters should be anchored to walls. These straps should be heavy steel, not flimsy ‘plumbing straps”. A standard water heater can easily weigh over 400 pounds and plumbing straps are inadequate. Most people only worry about gas powered heaters, but we are concerned with all of them. An electric heater that falls over will cause a huge leaking mess, not to mention the power connected is typically 20 amps 240 volts! This can easily kill anyone that comes in contact with an electrified puddle. Many homes suffer significant damage when they shift off their foundations or the walls that attach the home to the foundations buckle. 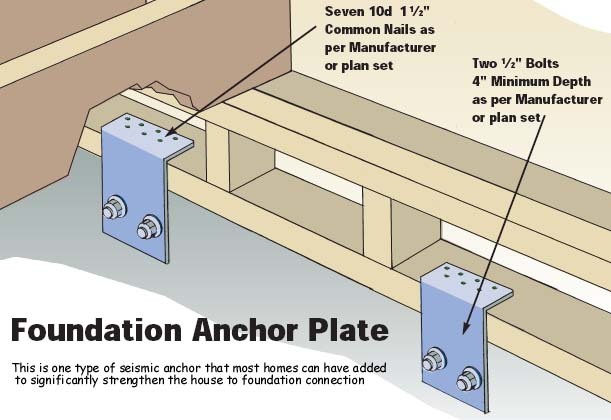 While it is no guarantee, proper anchor bolts, shear walls, and positive post to beam connections make a home much more resistant to movement during an earthquake. 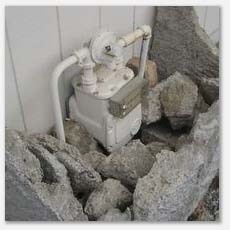 Most modern homes have these installed when the concrete is poured. They also can be retrofitted after construction. 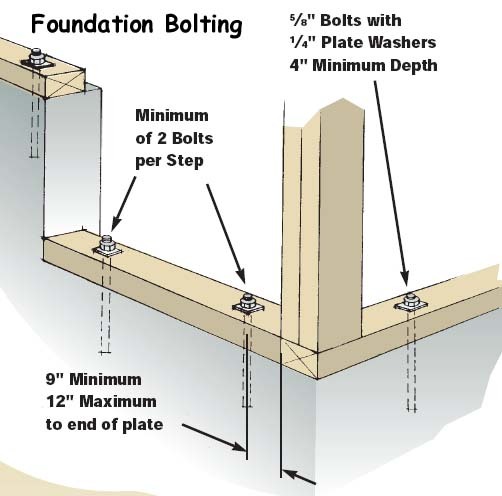 Another option is to have seismic anchors attached to the sill plates and bolted into the foundation. This type of retrofit can not only strengthen the home, but may make you eligible for reduction in homeowners earthquake insurance rates. 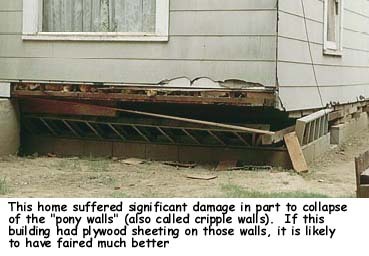 Also known as cripple walls, are susceptible to collapse in an earthquake. The lateral movement when the earth starts moving can cause this kind of failure. Most homes only have diagonal wood bracing, and this is often not strong enough to resist collapse. 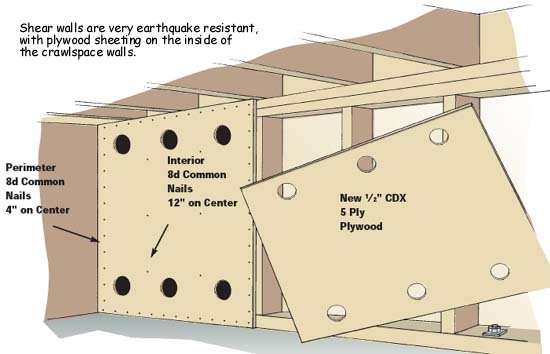 Shear walls have plywood nailed to them as in the diagram below. A positive connection where posts meet beams and where beams meet each other is usually a very simple, inexpensive step, and all connections should have them. 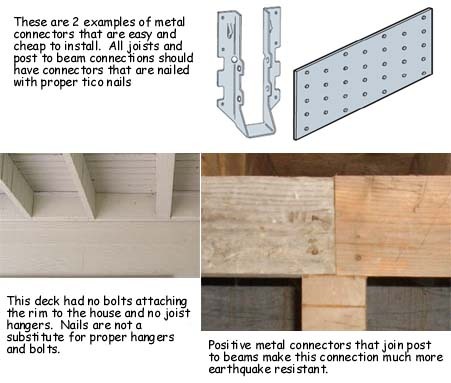 Many structures and decks are lacking joist hangers, again, a simple and cheap fix that can save your life and help your home survive an earthquake. Additional video content: earthquake preparation and survival tips.